Yesterday we arrived at the Stadtpark around 11, driving through the big city Hamburg is, lots of stuff to see. The weather was stunning; not too warm, and perfectly sunny. This was at least the 4th time John played this venue, the venue itself is nice, but the standing in line is a bit annoying here, partly because theres another gate on the other side of the venue. I felt excited walking up to the entrance. we're here again! Fogerty time! Creedence and Fogerty are in their own universe, you cant compare it with anything else. we were supposed to meet the others there but some of them were still sightseeing the harbour. Svenja and her friend Benjamin were already there, as well were... a flock of dutch Bruce Springsteen fans! they were surprised there was nobody there yet when they arrived at 10am, we were surprised there were allready people there. When Baltasar, Antje and Peter S arrived, we went for lunch somewhere in the park. we found a restaurant at the waterside, very nice, we had a nice view on all sorts of boats that came by. around 14.00hr we went back to the gate and there were some other old friends like Bernard from France. It was a bit weird to be there without people like Uwe and Martine and especially Anne and Alessio. Missed you, guys!! Funny stuff happening at the gates: two women tried to jump the line and the dutch sprinsteen fans didnt really dare to say something about it!!! some Germans werent, it almost turned into a fight, unfortunately. More and more friends showed up, more chatting, more Bruce stories. Bruce fans are funny people :-D and Bruce himself is quite the piece of work I believe!! but hey, I'm glad you dont have to line up THREE DAYS ON FOREHAND at a Fogerty show!! we were getting nervous... tried to assure ourself that we've been doing this so many times and that it almost always goes right, so we shouldnt worry. Standing there getting so extreme nervous, trying to calm down a bit, but I'm pretty sure, if i'm ever going to get an heart attack, it will be in line for a rockconcert 10 minutes before the gates open!! 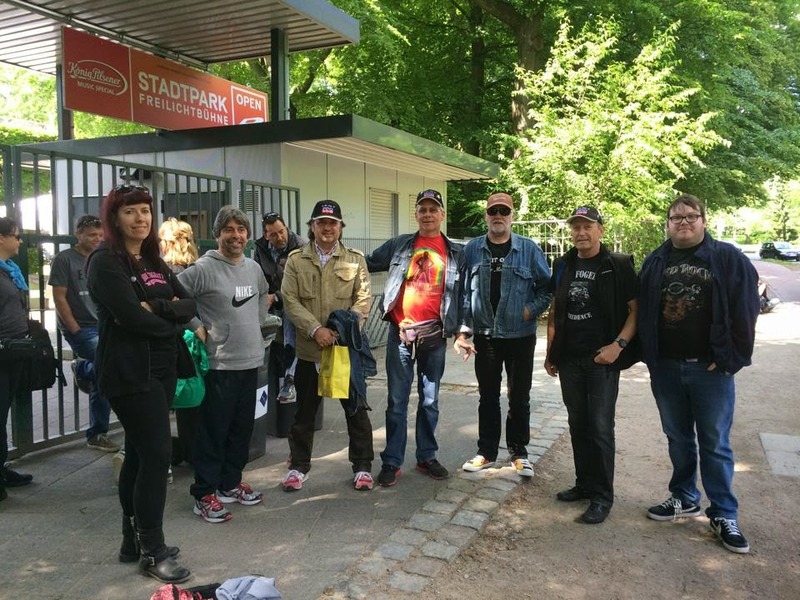 ah well, the sun was still shining, I was at a Fogerty show, with Robert, with a lot of friends, and the Stadtpark venue is very nice once you're inside. I went for a walk and a drink, it all felt pretty good. Then had some more nice conversations with friends and my mood went up fast. Pete Braun and his wife, and KP arrived shortly after us, and were standing directly behind us, though we had been making big fun of them as they were only able to leave home around 1pm, and had to drive pretty far. We've been joking all day "do they know the concert is today and not tomorrow?" and "if he's quick we'll have a drink with him after the show"
I sat down untill the show was about to start. pre-show music was partly same as always, wich is cool in a way. We've been listening to What I like about You for 17 years now :-) No matter where I am, if I hear that song on the radio, my heart starts beating faster. Fogerty!! The concert started at 7.30, and it kicked off with a rocking Travelin Band, one of my favorites. Started to dance and sing along, but the fact that I could hear myself sing along, as I was the only one, slowed me down again. oh dear, was it going to be one of those gigs? But, like we expected, they're pretty awesome and did a great job. Bassplayer James lookes like he's related to Bob Malone, he's jumping around all the time. there were some nice surprises in the concert. The new intro of Looking out my back door with Bob Malone on the accordion, super, the surprising intro of Hot Rod Heart.... and later in the show, the super swinging New Orleans! Endless Sleep wasnt much of a surprise as we heard it during soundcheck, but that doesnt mean we werent happy with it. It was great to hear it, always loved the song, and it also took me back to the times that I miss a bit, those wonderfull Fogerty years in '97 - '98 that felt like a dream and fairytale and pure magic at the same time.Its interesting to see how bassplayer James "detunes" his bassguitar during the song to get that special sound. Another highlight was Penthouse Pauper, wich he doesnt play a lot. All the time, there were a lot of Rickenbacker guitars. I wasnt only missing people onstage, but also off stage. its just totally weird to not have Anne around to dance on Keep on Chooglin, for example. And to not have Uwe and Martine around for the Rockin All over the world wave! Grapevind had awesome solo of Bob and awesome solo of a bouncing James. we then talked about Albert Heyn and that was a bit surreal. Also met a German woman who lived near our hometown as a child. Its a small world! In the mean time, we watched the trucks being loaded. The Bottle Rockets introduced me to the word "Van Tetris" but this was "Truck Tetris"
Henry the driver ran around conducting everything and a group of helpers pushed all the flightcases in the truck. We made sure we didt stand in the way. The bandvan drove inside the gate and that didnt make us happy, normally they come outside and take time for a talk. when the flightcases where loaded, they drove outside. we got half a glimpse of Bob Malone getting in and a whole glimpse of a waving Bob Fogerty, and because the windows were dark we didnt see anything else, what was quite a bummer. But so it be. We stuck around a bit more and then left, as we still had an hour drive to do to Michi's, where we had a few beers, a lot of laughs, and a lot of Haribo before we finally went to sleep.